Western Red Cedar and Northern White Cedar are coniferous members of the Cypress family. However, many people know Western Red Cedar for its rustic, resilient furniture. Others may know cedar as the sauna wood which withstands a lot of humidity and heat. Western red cedar grows in the Pacific North West of the U.S. The Northern white cedar grows in Eastern-Southeastern Canada and adjacent states of New England and the Great Lakes region west to Minnesota. Cedar trees grow mainly in rocky, wet areas where hardwood trees such as oaks and maples can’t grow. Cedar is desirable in waterfront areas because it contains no chemicals that can contaminate the water like pressure treated wood can. Red western cedar has twice the stability of most softwoods due to its low density and shrinkage factors. It produces long, lightweight lengths of timber with a fine straight grain and uniform texture. This makes it easy to cut, saw and nail with common tools. It also can be planed to a smooth surface or machined to any pattern. It will hold glue bonds and also provides a good base for many types of paints and stains since it lacks pitch and resin. Northern White Cedar is the lightest of any commercial wood. It is even-grained and finely textured. The heartwood is resistant to decay and subterranean termites. It is easy to work, glues well and holds paint well. Northern white cedar also experiences little dimensional change. Both cedars are insect and rot resistant because of oils they naturally contain. Cedar is also valued for its distinct aroma as its pungent aromatic oils are believed to discourage moth and carpet beetle larvae infestations. All of these factors make it the premier choice for either interior or exterior home use. Cedar wood has been primarily used to make rustic fencing and posts, but can also be used for cabin logs, lumber, poles, shingles and other specialty type products. 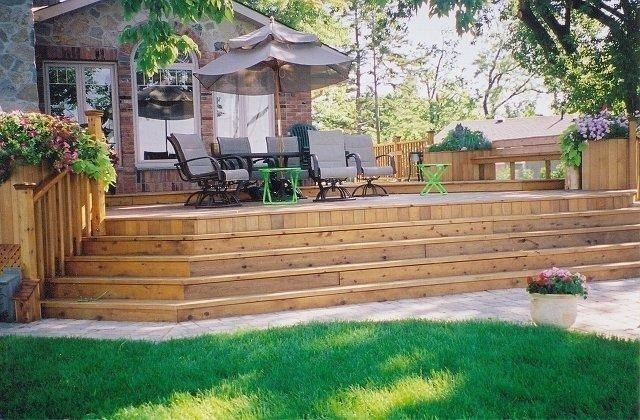 Cedar is a natural wood for longevity and an excellent wood choice for various applications. Cedar’s natural resistance to moisture, decay and insect infestations makes it more resilient for outdoor projects. Properly finished cedar will last for decades, even in harsh environments. Think beautiful cedar for your next wood project. At Copper Roof Ontario we have a large selection of Rainchains to choose from. Add beauty and function to your home. Rainchains are gaining popularity with people that want an artistic and unique alternative to traditional downspouts. 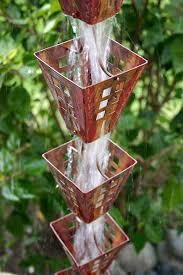 An attractive, unique, copper, hand-crafted rainchain will add excitement and positive energy to any outdoor space. Rainchains (also known as Kusari Doi) originated in Japan, dating back more than a century ago. Rainchains are used in the Japanese Feng Shui known as Fushui, meaning wind and water. The rainchain is placed throughout gardens as a water feature and can also be functional by directing rain water into cisterns or rain barrels to be used in the garden at a later time. This practice of conserving water is a great idea for the eco-friendly minded individual. Copper rainchains can be as individual and unique as the person buying them and offer a real artistic focal point and charm to any garden or home. There are many different styles including cup, link and floral designs. They are extremely easy to install by securing it to your gutter and securing the bottom to your rain barrel or a nice cedar box filled with decorative stones and can be beautifying your garden in 10 minutes. To learn more visit; www.copperroofontario.com and contact us. 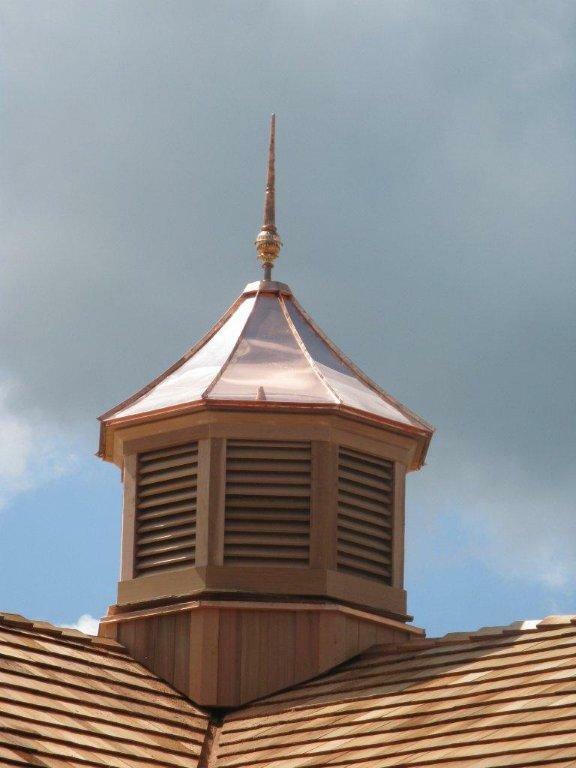 When choosing your next roof if you are concerned about your personal carbon footprint and want to minimize your impact on the environment choose copper. Copper is 100% recyclable and in some cases the manufacturer’s new product is made up of 95% recycled copper, reducing landfill and production emissions. There is also no limit to the amount of times that copper can be recycled, so new product doesn’t always have to be mined making copper a sustainable product. Copper was first used by mankind 10,000 years ago. Nearly all of the 700 billion pounds of copper mined worldwide to date are still in circulation today. With 5.8 trillion pounds of known copper resources on Earth the supply of copper seems to be unlimited. 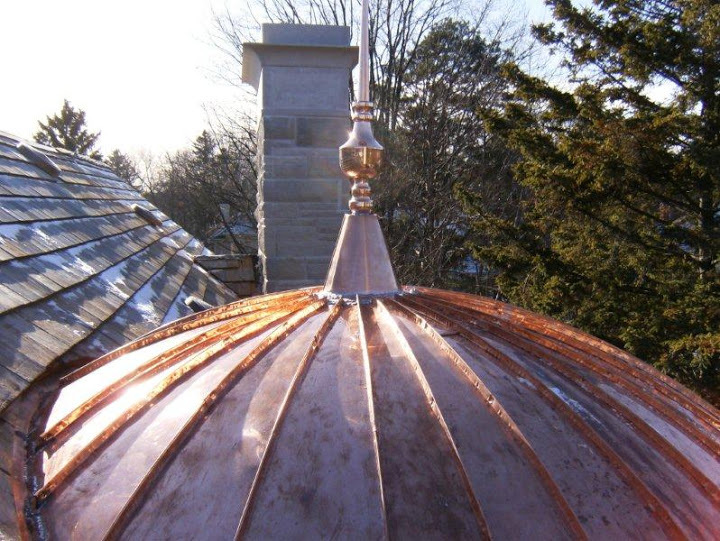 Copper roofs and other architectural applications’ durability and life span are generally measured in generations not years because of copper’s exceptional ability to last and look great. Add to this durability the fact that copper naturally inhibits the growth of harmful pathogens such as bacteria, mould, algae, fungus and viruses and you have a 100% eco-friendly product that is beautiful and will add long term value to your home for many years to come. 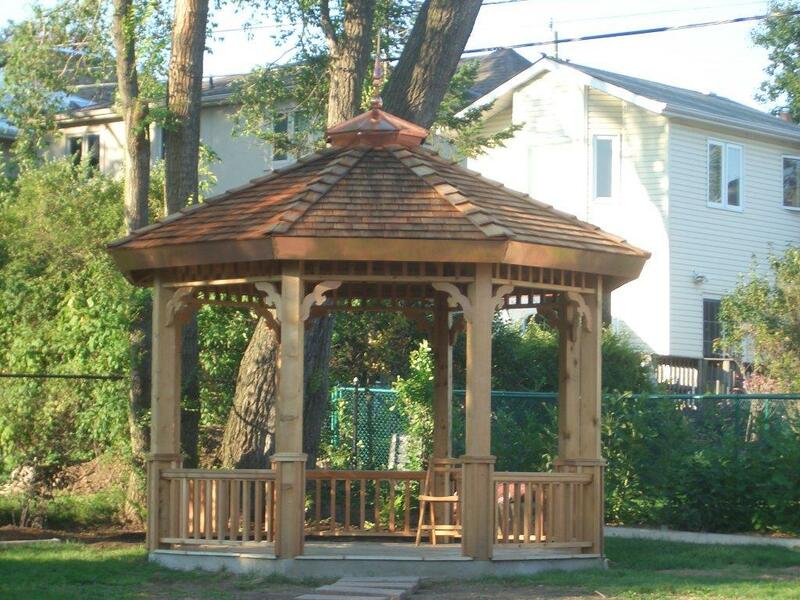 Cedar roofing is an eco friendly, environmentally sustainable, green product. Every year, more than 175 million seedlings are planted in B.C. to reforest areas that have been harvested. Young, fast growing forests absorb the most carbon dioxide and release oxygen, cleaning our air. The harvesting and production of cedar shingles and shakes has very little environmental impact, low pollution and best of all, once the product is ready to be replaced it is biodegradable. The cedar shingle or shake provides natural additional insulation to your home, the wood keeps the heat in your house in the winter therefore cutting down on heating costs. The cedar shingle is cut on both sides by a saw, making them a smooth, refined surface product. Cedar shakes are split on the surface side to create a more rough and rustic look. Cedar has a built in protection not needing added chemicals before installation, making it the more green choice. Let’s make your home beautiful and “green” with Cedar roofing! My cedar outdoor project is done, now what? How? When? and Why? Should I protect my cedar project are great questions that are repeatedly brought up when cedar is the choice made for your project. Cedar wood only needs to sit before staining if it is still holding sap moisture, if it is then one season is fine to sit. The how? Every paint and stain manufacturer has their own set of rules when it comes to using their products. Each of them starts with opening the pores of the wood before you start in order for the product to penetrate properly and more evenly. You can use sandpaper with a grit between 80 and 100, which is medium grit, to lightly sand the cedar and open the pores. Just to sum it up. Prep work, prep work, prep work! On to the when? Spring or Fall are ideal times to stain your cedar because the heat of Summer can cause most products to flash dry, not letting the product do its job. Moisture levels can be a bit of a nuisance in the Spring so be prepared to be a little bit of a meteorologist. It is suggested to stain or protect your cedar every 2 years….but you will be able to tell when it is needed (more often in high traffic areas). The Why? A better question would be “what do I want the cedar project to look like in a years time?” The answers to that are: A beautiful grey patina or like the day you built it. Keep in mind that any time you stain or seal a cedar project you will block the natural cedar smell but not 100%. The colour and type of products are completely up to your personal preferences. Kiln dried or Green lumber, what is the difference? 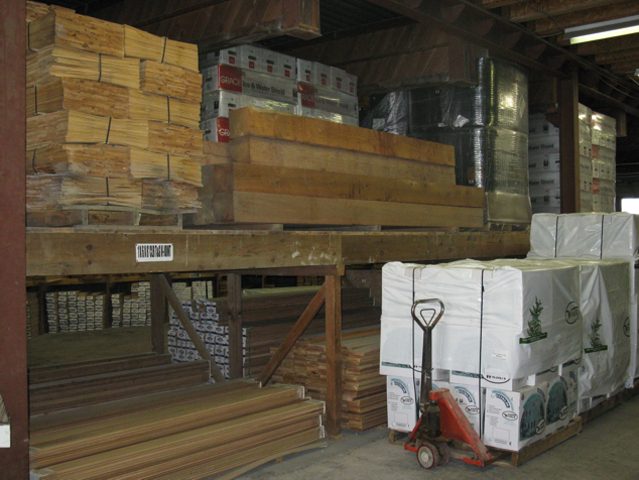 Kiln dried lumber is put into a large oven and force dried down to approximately 12% moisture. Green lumber is lumber still holding sap moisture from the field. That could be a moisture level of 20-30% moisture or greater depending on where it came from. This type of question should come up when attempting a project with any joins, 45 degree cuts and miter cuts. The problem being when the wood is holding moisture it will have a tendency to shrink and create gaps in your joins and miters. This will create water penetration points and cut down the longevity of your project. Choosing an under mount fastening system is another way of adding longevity to your deck project. This will eliminate any surface water penetration point.